INVISIBLE-EXPORTS is pleased to present Blood Sacrifice, a new video work by Genesis Breyer P-Orridge at Moving Image. Blood Sacrifice is a valentine to a love both lost and enduring. 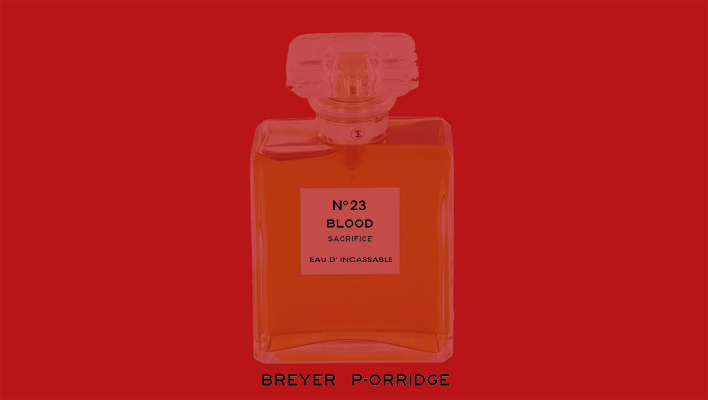 The video, of two perfume bottles filled with blood, is presented in three views. One bottle slowly crumbles and leaks its contents onto the bandage-like muslin below. The liquid slowly spreads, eventually reaching over and encircling the intact bottle. The blood in each bottle is real. The intact bottle contains that of Lady Jaye Breyer, the first gift given to Genesis P-Orridge as their courtship began. The second bottle contains Genesis’ blood from her breast implant, given to Lady Jaye a few years later. Beginning in 2003, Lady Jaye and Genesis actively devoted themselves to Pandrogreny. A declaration of intent and depth of commitment, this project explores re-union and re-solution of male and female to a perfecting hermaphroditic state. This includes having cosmetic surgeries that blur the lines between their sexes and bring them nearer to being physically one, serving both as a gesture to an all-consuming romantic love and a reminder that evolution is not at an end. Four years into the project, Lady Jaye passed away. But she and Genesis continue to collaborate as BREYER P-ORRIDGE, putting into question not only the limits between self and other but also life and death. Blood Sacrifice is the most recent chapter of this story, operating as a poetic questioning of mortality and eternal love. Blood Sacrifice is an edition of three. Each video comes in a box containing a portfolio of blood prints, as well a vial of blood. This is video was produced with TOM POWEL IMAGING. Special thanks to Nathan Maxwell Cann. Genesis Breyer P-Orridge was born in Manchester, England in 1950. S/he was a member of the Kinetic action group Exploding Galaxy/Transmedia Exploration from 1969-1970. S/he conceived of and founded the seminal British performance art group Coum Transmissions in 1969 and was the co-founder of Throbbing Gristle, Psychic TV, and the spoken word/ambient music performance group Thee Majesty. Throughout Genesis’ long career, s/he has worked and collaborated with William S. Burroughs, Brion Gysin, Derek Jarman and Dr. Timothy Leary, among others. With Lady Jaye, h/er art has been exhibited internationally, including recent exhibitions at Deitch Projects, Mass MOCA, Centre Pompidou, Contemporary Art Museum St. Louis, Barbican Museum, the Swiss Institute and White Columns, amongst others. S/he has recently lectured and/or performed at the New Museum, MoMA, the Serpentine Gallery, amongst others. H/er archive can be found in the permanent collection of the Tate Britain Museum. An award-winning documentary on their life, The Ballad of Genesis and Lady Jaye, was premiered earlier this year. Moving Image, an art fair of contemporary video art, will take place March 3-6, 2011, during the Armory Show in New York and within walking distance of Independent. Located in the the Waterfront Tunnel event space between 27th and 28th Streets with an entrance on 11th Avenue in Chelsea, Moving Image will be free to the public and open Thursday – Saturday, March 3-5, 11-8 PM and on Sunday, March 6, 11-3 PM. An opening reception for Moving Image will take place Thursday, March 3, 6-8 PM. The Moving Image curatorial advisory committee has invited a selection of international commercial galleries and non-profit institutions to present single-channel videos, video sculptures, and other larger video installations. Moving Image has been conceived to offer viewers a unique viewing experience, providing a rich program of time-based work from around the globe by today’s most important and exciting new artists.